Are you finding customers more and more fickle, less and less loyal, and ever ready to jump off the handle and on to Twitter? Are you starting to sense that the way you've always done customer service simply isn't working anymore? You're right to be alarmed. Terrified, even. Social media, self-service technologies, and smartphones have created a disorienting new landscape for businesses that were chugging along just fine as recently as last month. You now hold the solution to those concerns in your hands. 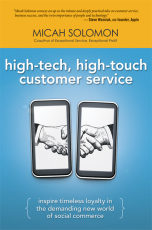 High- Tech, High- Touch Customer Service is the guide that teaches you to harness the power of technology to build emotional connections with your customers -- and generate fierce loyalty as a result. You'll learn how to bulletproof your business against the increasingly challenging world of customer interactions, both online and off. This book is the tool you need to regain your balance in a world where socially empowered customers pound companies with ever-escalating expectations and where complaints can quickly go viral, with devastating results. This is the book you've been waiting for: eyeopening insights, real-life disaster stories, and a sweeping perspective to help you make sense of the seismic changes in customer service delivery. It will help you fully grasp the crucial new rules that dictate who will survive and thrive in the years ahead.